This house is almost fully glass and has lights everywhere, yet mobs still spawn in it. Both the top and bottom floor. Any idea why? Usually if the area is lit enough mobs shouldn't spawn. But if your're still having problems it's because of the stone blocks. Mobs spawn on natural blocks but don't on crafted blocks. mastery51 wrote: Usually if the area is lit enough mobs shouldn't spawn. This is the image? Based on this image the middle ceiling and floor is glass. There are still some exposed natural blocks on the sides of the ceiling that the mobs can spawn on top. I marked all areas with natural blocks that mobs can potentially spawn even if you have a lot of light. If these few blocks are turned to glass or some type of crafted block than the mobs should stop spawning, based on what I can see. You wouldn't even need that much light. This also includes the bottom floor of the base, were the red rectangle is. Yes, that is the image. Will those blocks also cause the mobs to spawn on the glass floor area? Or is it possible that the natural blocks behind the glass floor will cause them to spawn there? joni65 wrote: Is it possible that the natural blocks behind the glass floor will cause them to spawn there? No the background blocks are safe because mobs only spawn on top of foreground blocks. It's only the natural blocks you gather from the worlds and have an exposed top area for mobs to spawn on top of. 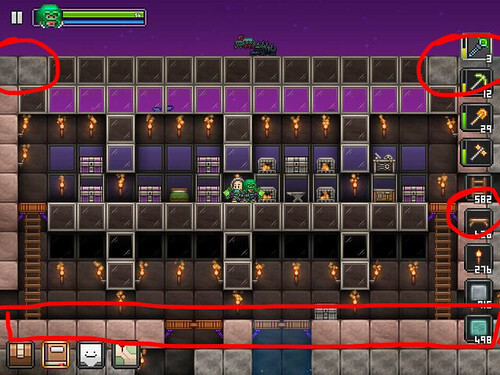 joni65 wrote: Will those blocks also cause the mobs to spawn on the glass floor area? Possibly, but only on the stone blocks that are just to the right and have an exposed top area for them to spawn on. Your natural stone walls on your house are safe because you have those blocks stacking on top of each other, keeping mobs from spawning on top of them. But the blocks on the roof have an exposed top. That's why the Mobs are on the roof and the ground level and possible the middle glass floor area. Okay, thanks. This was driving my hubby crazy. He can stop cussing at his iPad now!